Our martial arts classes for children are based on child development and practical applications. I personally believe that children are our treasure and as a parent there is nothing we will not do to protect them. as a result of this sentiment we make sure that our martial arts classes are safe and provide a stimulating learning environment. The key our program also relates to child development and behavior modification. 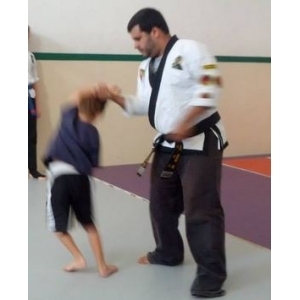 The activities we introduce as part of our martial arts program are based on the development stage (mental and physical) of our children as well as an introductory assessment made by Master Delgado (Dr. Delgado) during their initial introductory classes. This particular assessment is critical as the same is a key piece of each student’s personal lesson program. In other words, while everyone is exposed to the basic same information the order and the technique used to introduce these concepts vary based on the particular child. Strength training is a form of physical conditioning used to increase the ability to resist force. In our kids martial arts program we use different types of exercises such as plank, push-ups and a multitude of stomach exercises as part of this training. Our goal is to increase their strength and assist with muscle development while actively participating in our martial arts children classes. Cardiovascular training also known as aerobic training strengthens the lungs and the heart. Cardiovascular training also improves muscle function by increasing the oxygen levels withing the body and the efficiency in which the body processed the same. In our martial arts classes for children we use tae know do with its multitude of kicks as one of the primary components of our cardiovascular training program for children. Spatial Awareness. How a child senses his body in relation to his physical surroundings. Balance. Bio mechanically speaking balance refers to the ability to attain equilibrium whether standing still or moving. Rhythm. The ability to feel and express a steady beat. Development of rhythm has been proven to positively increase children’s overall school achievement, as well as mathematics and reading achievement. Strength control. As children grow they need a measure to recognize how much force is needed to accomplish each task. 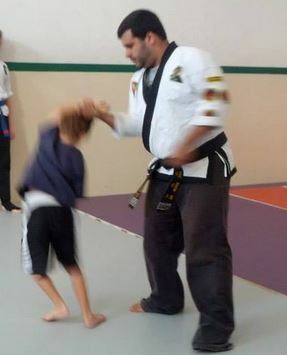 Thru our martial arts classes we teach children how to exert enough pressure in the most efficient manner. Learning to control this strength as they grow is also critical as to not hurt anyone by accident.